Never Mind The Bullocks: Surprisingly, Bullock didn’t have many signature sarcastic lines in this episode–none that particularly stood out. Him shooting that Court of Owl guardian with the shotgun was badass, though. “Pretty Hate Machine” has a lot of storylines going on tonight which is a bit concerning, since the two-part season finale is just next week. 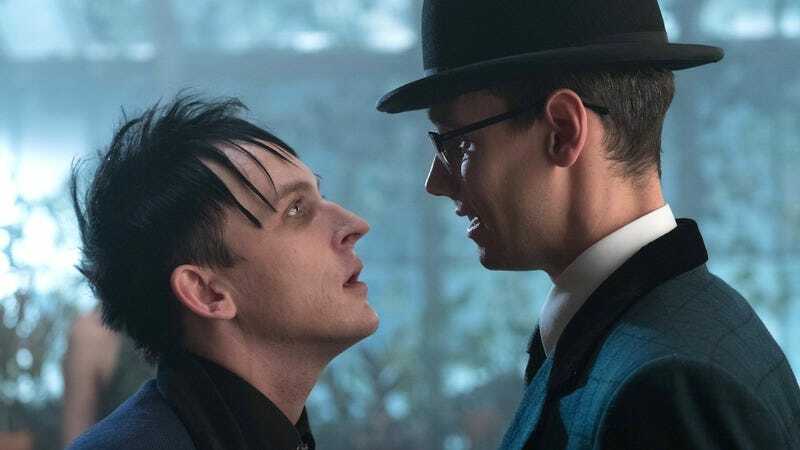 That being said, I tend to think that Gotham works best when it throws everything at the fan, as long as the craziness is fun, active, and constantly moving. Slowing things down forces the writers to attempt to be dramatic and/or nuanced, and it rarely works. Example: watching Alfred desperately do whatever he can (which includes dangling Strange off a roof) to find Bruce is an active way to showcase how much he truly cares for his ward. He does find him, and kills that Temple Shaman who controlled Bruce, but the two have some brain-washing to overcome. The Court of Owls, and their whole “control all of Gotham” schtick, was a dead-end, wasn’t it? 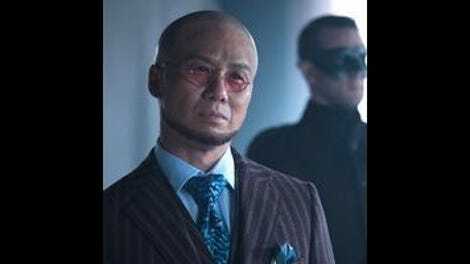 The Temple Shaman (the one who trained Bruce) is not only the leader of the Owls, but is working for someone else who is apparently pulling all the strings? I feel like having the high council killed off so easily was the writers lampshading how lame they were in the first place, but I’d be giving them too much credit. Going to be honest: I’ve lost the Lee Thompkins thread several episodes ago. Her motivation has always been massively suspect; she’s been like the Frank Grimes of the show, shouting about how dark and deranged Gordon supposedly is, but everyone just ignores her. (The show rarely displayed that trait in any significant way, so it did make her seem crazy.) That all being said, infected Thompkins is a way more interesting figure, mainly because she now makes sense, in terms of the show at least. Morena Baccarin is clearly having more fun in the role. And the virus effects are really well done. Shockingly, the criminal underworld events are the least interesting here, even with the return of Barbara. This is mainly because it gets regulated to C-story status, and doesn’t get much time to breathe. All the actors are game, as usual, and even the return of Fish Mooney is intriguing, even though she’s never been a strong character. Kudos to letting the bomb go off, which is a narratively ballsy move. But that only means yet another obstacle (a large chunk of the city infected with the Tetch virus) for Gotham to solve. Even with two solid hours, I can’t imagine that this show will be able to resolve them all graciously. But it will certainly be a crazy ride for sure. Maggie Geha as Ivy is working better than I believe most people expected. She’s just a hapless child in an adult body, but her innocent loyalty is really endearing. Oh, and Gordon is infected too, since it was the only way out of the coffin. I don’t know what to think of this. Gordon is like the least interesting character now. Thanks to Kyle Fowle for letting me sub in today as he’s off reviewing wrestling.